“The saint of Staten Island” (People magazine) shares the inspirational story of how she’s changing the world, one child at a time. Over a decade ago, Elissa Montanti was reeling from the loss of several loved ones when she decided to work past her grief by collecting school supplies for Bosnian children. Then a U.N. ambassador showed her a photo of Kenan, a young boy who had lost both arms and one leg to a landmine. Elissa invited Kenan and his mother into her home, arranging free airfare, prosthetics, and medical care. Operating out of her apartment’s walk-in closet, Elissa’s Global Medical Relief Fund has since helped more than one hundred and fifty children from twenty-two countries injured in war zones and natural disasters around the world. 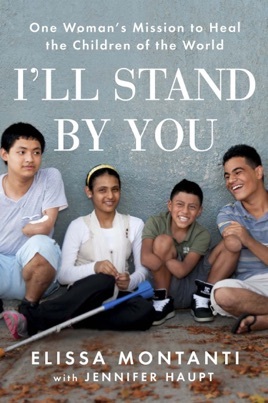 I’ll Stand by You recounts Elissa’s remarkable story and how—in helping these children—she healed herself. After her parents divorce and the deaths of her mother, an old boyfriend, and grandmother, Montani was holed up in her small Staten Island apartment working as a medical assistant and suffering from debilitating panic attacks and depression. Her fog lifted when she wrote and performed a song for a local Bosnian relief fund-raiser in 1997. She was inspired to do whatever she could when she found a letter from a 14-year-old Bosnian boy named Kenan who had lost his arms and a leg in a land mine. He had outgrown his donated prosthetics and desperately needed new ones. I want to help, Montanti said without hesitation, realizing her own problems paled in comparison. Soliciting donations from companies, surgeons, and airlines, the Global Medical Relief Fund was born. Kenan and his mother flew to New York City and stayed with the author while he underwent physical therapy and fittings. With no money, no office (except her closet), and, eventually, no job, the GMRF went on to bring more than 150 children to the U.S. to be fit with prosthetics. The author s spirits are as changed in this straightforward and sweet narrative as the lives of those she helped and she finds hope, happiness, and love along her difficult but rewarding journey. I'll Stand By You - FANTASTIC!!!! I really enjoyed reading this book, and it is hard to express how much I admire Elissa Montanti. Elissa's story is so compelling, and she has been able to touch so many lives by her dedication and devotion that it's simply incredible. And I'm sure that this book just skims the surface, and gives just the slightest glimpse into the true magnitude of her work. I believe that if you were to diagram how many lives she has touched (either directly or indirectly) by her work through her foundation, it would boggle the mind. Elissa has been a force for good; for love; for humanity. Elissa, quite simply, defines and embodies the term "humanitarian". This book is extremely personal; extremely well written & accessible; and provides warmth, humor, love and inspiration. I hope I get the honor of meeting Elissa in person some day. I've read that she has been called the Saint of Staten Island; that some call her an Angel here on Earth. To me, she represents the closest thing I can imagine to a true hero. Read this book, and I guarantee Elissa's inspirational spirit, drive and love will shine through.